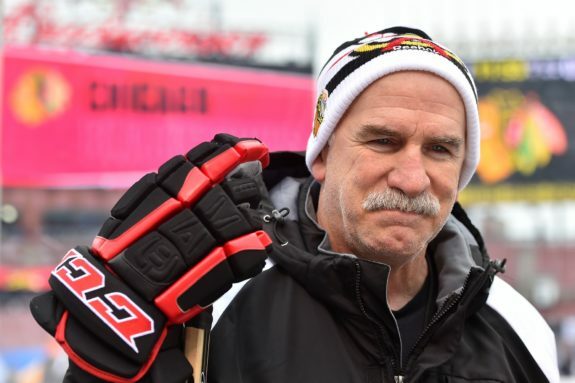 Joel Quenneville: Greatest Head Coach in NHL History? If you have even a limited knowledge of NHL history, I can probably guess what you’re thinking: No. Has this guy lost his mind? No sane individual with at least a modest appreciation for the game’s history would attempt to craft an argument that the venerable William Scott “Scotty” Bowman is not the greatest bench boss to ever grace the league. That would be like arguing “The Great One” Wayne Gretzky isn’t the greatest player to ever lace up skates. Like “His Airness” Michael Jordan isn’t king of the hardwood. Like Michael Phelps isn’t the best Olympic swimmer of all time. And if you reside in Scotty Bowman’s corner, you’re in great company. His resume is second to none. But, hear me out. What Joel Quenneville has accomplished in a league that harbors more teams and greater parity than during Bowman’s head coaching days is awfully impressive. Impressive enough, perhaps, to vault his name to the very top of the NHL’s coaching elite. Before I state my case for Joel Quenneville, let’s make one thing clear: Quenneville does not (yet) have Scotty Bowman’s overall resume. As it pertains to the regular season, the coaches’ accomplishments are more comparable than one might think. Perhaps the only real difference between Bowman’s and Quenneville’s regular season resumes is the length of tenure. Bowman logged 30 NHL seasons, either in whole or in part, as a head coach over the span of 1967 to 2002. 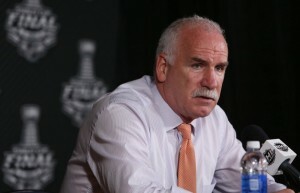 Quenneville, nearing the finish of his 20th season, has held a head coaching position since his debut in 1996 (including certain partial seasons as well). At face value, Bowman’s record-shattering 1,244 regular season wins far eclipse Quenneville’s 851, who became Bowman’s runner-up last season. However, if considered on a per-season basis, the gap between the NHL’s two all-time winningest coaches is marginal. Strictly on a per-season basis, Quenneville’s average of 43 wins is better than Bowman’s 41. If taken in the context of wins per 82 games (to account for variations in games played), Bowman averaged 48, slightly besting Quenneville’s 45. Even though the NHL has endured a variety of changes to their point system over the years, points percentage is another useful tool to benchmark regular season coaching success. Over his career, Bowman earned 65.7 percent of the total points possible, tied for first all time among head coaches with at least 400 games. Quenneville is fourth at 61.9 percent. A slight edge to Bowman. The postseason is where, at least on paper, the two resumes diverge. Bowman and Quenneville have coached the most and second-most playoff games in NHL history at 353 and 211 respectively. That certainly means something, as getting to the postseason consistently can be considered an element of greatness. To no one’s surprise, Bowman has the most playoff wins of all time with 223. Quenneville is third with 118 and needs six more to pass Al Arbour and move into second all-time. In terms of postseason winning percentage, it’s a clear nod to Bowman. “Scotty” is third all-time among those coaching in at least 30 playoff games. Bowman’s 63.2 percent postseason win percentage is notably better than Quenneville’s 55.9 percent, good for 18th. Bowman’s 48-19 record in playoff series is also awfully impressive. Quenneville’s is very good at 23-14. And then there are the championships, which to many are the single most important mark of greatness. Bowman is the class of the field, winning nine Stanley Cups in 13 Final appearances. Quenneville has won the Stanley Cup in all three of his Final appearances, good for a tie for eighth place all-time. Yes. Not only does it matter, it’s critical. Despite the fact that the first six years of Quenneville’s head coaching career overlapped with Bowman’s last six, there are substantial differences in the respective eras during which Bowman and Quenneville operated. And some of these differences, without question, materially impact a head coach’s ability to win. While the differences are plentiful, I’ll focus on two: league size and roster restrictions. The NHL was comprised of 26 teams when Quenneville made his head coaching debut during the 1996-97 season. Over his first four years, the league underwent minor expansion. Since his fifth season (2000-01), the league has continuously operated under its still-current size of 30 teams (excluding the Vegas Golden Knights’ forthcoming inaugural 2017-18 season). The NHL’s 16-team playoff, albeit under varying formats, has spanned Quenneville’s entire career. 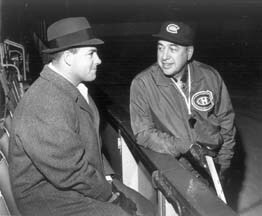 Jr. Habs coach Scotty Bowman with mentor Toe Blake. The league looked much different in the prime of Scotty Bowman’s career. When Bowman made his NHL head coaching debut during the 1967-68 season, the NHL was in its very first year of the expansion era, which started with doubling the league’s size from the Original Six teams to 12. Bowman’s career spanned each and every expansion that took the NHL from six teams to 30. While Bowman did coach his final two seasons and win his ninth and final Stanley Cup (as a head coach) in a 30-team league, the majority of his success came well before the NHL reached its current state. Bowman’s first five Stanley Cups were won in a league ranging from 16 to 18 teams, including four via a 12-team playoff format and one via an eight-team playoff. Bowman’s last four Cups were won via a 16-team playoff, including one in a 22-team league and two others in a 26-team league. 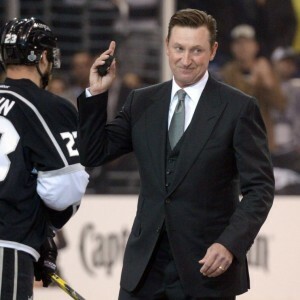 Also, to both his credit and detriment, Bowman reached the Stanley Cup Final during his first three years. These appearances were largely made possible only because all six of the 1967 NHL expansion teams were placed in a division opposite of the Original Six teams. In other words, Bowman coached the best of a bad bunch. Bowman’s teams went 0-12 during his first three Stanley Cup Final appearances, and he very likely would not have made such appearances if the league was reorganized with a mix of Original Six and expansion teams in each division. Perhaps even more meaningful than the size of the league during Bowman’s and Quenneville’s respective head-coaching tenures are the differences in roster restrictions. Before a resolution was reached as a result of the 2004-05 lockout, the NHL was the only major North American professional sports league that had no luxury tax, limited revenue sharing, and no salary cap. And what does that lend itself to? Dynasties. During the Original Six era and up until the 1970s, when the newly-formed World Hockey Association (WHA) began to compete for NHL talent, player salaries were not viewed as an issue. Much of this was attributed to the reserve clause, which essentially gave each team full control of a player even upon the expiration of a player’s contract. Given that the rights to players with expired contracts were generally retained by the team, free agency did not exist unless a controlling club granted a player an unconditional release. Even after the reserve clause was effectively rendered useless by the mid-1970s due to a series of court actions, keeping a dynasty together was not difficult. Players were still unable to become unrestricted free agents prior to reaching 31 years of age. With no salary cap and a team’s ability to match contract offers to restricted free agents, only a team’s financial resources served as a barrier to retaining their best talent. In fact, many teams were willing to extend beyond their financial resources, as players’ salaries became disproportionately high compared to team revenues. This led some teams, and the league as a whole, towards financial difficulties. These issues culminated in the 2004-05 lockout, which resulted in the implementation of a salary cap and a more player-friendly free agency, including the ability to become unrestricted at an earlier age, which can now occur in a variety of ways but generally no later than 25 to 27 years of age. The proof is also in the pudding. Consider the trend of Stanley Cup champions during much of Bowman’s era. Starting in 1968 and through 1993, during which 26 NHL seasons were played, only seven organizations won the Stanley Cup. Three—the Canadiens, Oilers, and Islanders—accounted for 19 of those. 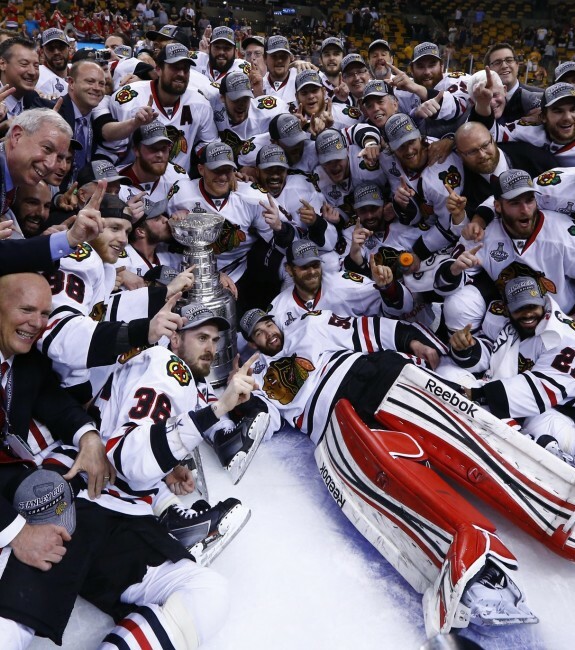 The same amount of clubs—seven—have hoisted the Cup in the 11 seasons since the 2004-05 lockout. No franchise has repeated as Stanley Cup champions since the salary cap era began, with the last to do so being Bowman’s 1997 and 1998 Detroit Red Wings. Making Quenneville’s three salary cap era Cups even more impressive is that only one other coach, Darryl Sutter, has even been able to win a second championship during the cap era and, in fact, since Bowman’s 1998 Red Wings repeated as champions. Perhaps the question I raised in the title of this article will best be answered when Quenneville’s already-illustrious career is complete. At age 58, he is still 10 years younger than Bowman was during his final season. Meaning, should Joel Quenneville be fortunate enough and choose to coach another 10 years, he could cap off his 30th season at the same age as Bowman. At his current pace, doing so would make Quenneville the NHL’s all-time leader in regular season games coached, wins, and points—put simply, the best regular season coach to ever command an NHL bench. And quite possibly, the greatest ever.